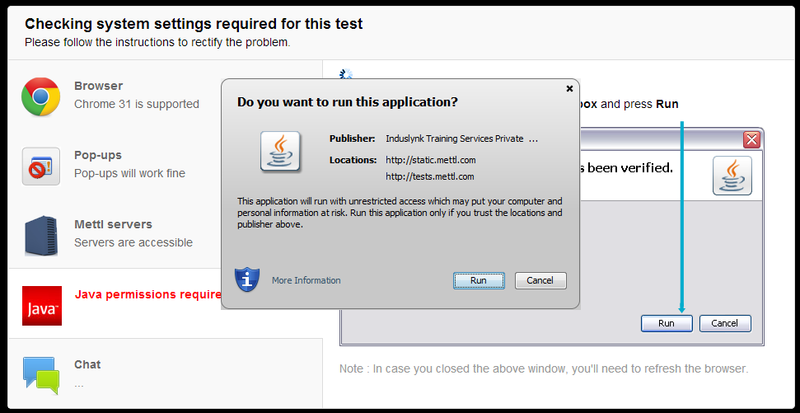 Disable all browser plug-ins except Java™ (Please refer to the section "Java Plug-in") before starting your test. Internet connection with at least 15kbps speed. If you have third-party webcam software installed on your system, uninstall it prior to starting your test. If there is a third-party webcam software installed on the system before a candidate then that would need to be uninstalled before the test starts. Firewall permissions to ports 1987 and 1988 for pr.mettl.com should be granted so that pr.mettl.com:1987 and pr.mettl.com:1988 should be accessible. Please ensure that you follow the below guidelines before starting your test. Disable all browser plugins except Java™ before starting your test. Uninstall any external browser software that might be present on your system prior to starting your assessment. Note: These are not prerequisites, and your test will start even if these requirements are not fulfilled. However, one of these might interfere with the functioning of your test. We strongly recommend that you ensure the above to have a smooth test-taking experience. Please reach out to us at +91-82878-03040 (Support) in case you face any issues regarding the same. 1. Click the link sent in invitation email to reach test registration page. 2. 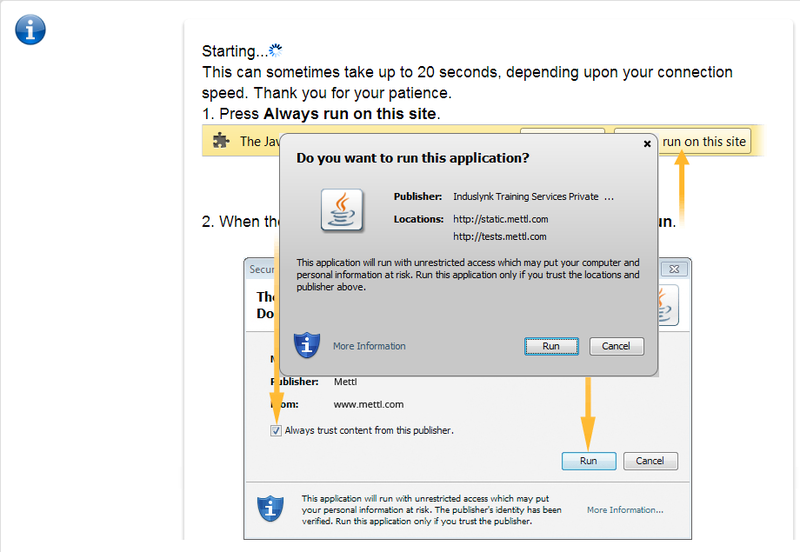 Follow the instructions on the screen & grant permission to the applet to run. 3. Fill the test registration form and click "SUBMIT & PROCEED" button. 4. Read the Assessment Instructions and click "Launch Test" button. 6. Click on "Run this time" at the top of the webpage. 7. 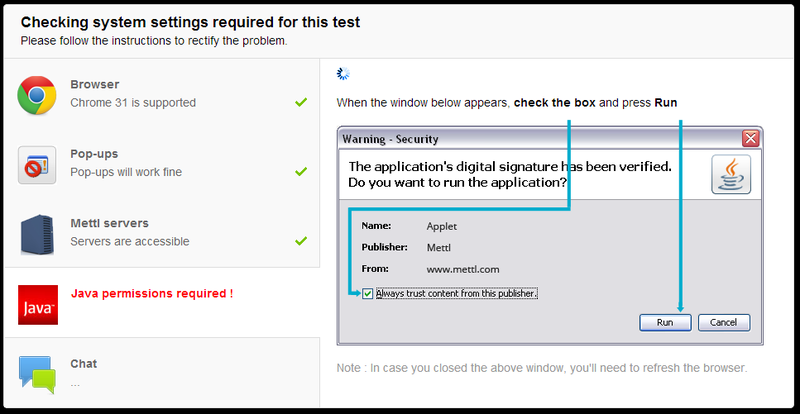 Follow the instructions on the screen & grant permission to the applet to run. 8. 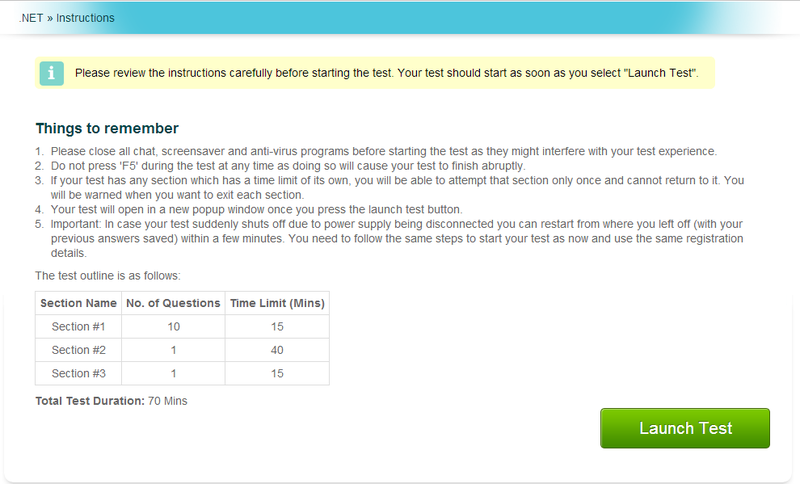 Attempt the questions in the test & click "Finish Test" when done. In case power/ network connection is lost in the middle of the test, the candidates can resume their test with the same e-mail id that was used in the initial attempt. This can be done within a timeframe of 30 minutes from the point of encountering the failure. When network connection is lost in the middle of the test, the system makes an attempt to reconnect with the server. If five such attempts fail consecutively, the candidates are presented with a warning message. Thus, the test window remains active till after a few minutes of losing the internet connection before the below network error notification appears. In such a case, the system waits for 30 minutes before it expires the test & generates the report for the candidate. The test can be resumed within this time-frame. The test resumes from the point of last communication with the server. Thus, candidates' attempts as well as the remaining time are saved according to the point of last communication. Since, the test window remains active for a few minutes while the system attempts to reconnect with the server, the answers marked by the candidate during this period are not sent to the server & are not seen when the test is resumed. In case of power failure as well, the test can be resumed within a time-frame of 30 minutes. The test resumes from the point of last communication with the server. Since the test syncs with the server every few seconds, candidate attempts between the point of last sync up & the point of power failure might be lost. So, the candidates' attempts & the remaining time are saved according to the point of last sync up.